Successfully Added iPod + iPhone Stereo Speaker Docking Station with Alarm Clock to your Shopping Cart. iPod and iPhone Stereo Speaker Docking Station with Alarm Clock. Listen to your iPod or iPhone without the need for earphones, recharge your iPod or iPhone without the need for a computer, and wake up to your favorite tunes straight from your iPod or iPhone every morning. This is one useful bedroom companion! If you do not own and iPod, but own an iPhone instead, then no worries. The iPod application within the iPhone is supported by this iPod docking station and works just like and iPod. Sometimes you want to listen to your music without having to wear headphones, right? Why be slaved to a wired headset when you can listen to your digital music from these compact but powerful stereo speakers? As an added bonus, this docking station acts as a recharging dock for your iPod and iPhone. Yes, the CVGS-E12 makes a great docking station - but guess what else? It is also a terrific alarm clock! Nothing puts you in a bad mood in the morning like waking up to a song you hate or a morning talk show, right? 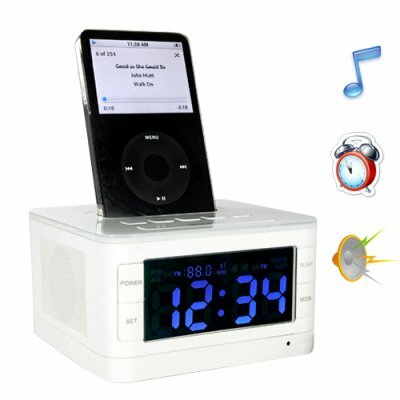 Now with our iPod and iPhone Stereo Speaker Docking Station with Alarm Clock you can wake to your favorite music every day. Programing the alarm via the onboard buttons or remote controller and quickly fall asleep knowing your next morning will be a pleasant one. The docking station's minimalist design, soft tones, and universal docking cradles make it aesthetically and technically compatible with the iPod family of products. The docking station's remote control has a number of functions including the best button ever placed on a remote control: snooze! This docking station fully supports the iPod application within the iPhone. It is not designed to work as a hands free unit. But you will still be able to receive and make calls. The battery inside the docking station backs up time and alarm settings in the event of a power failure. The clock's large display face has five levels of brightness and can display time in 12- or 24-hour format. When I insert my iPhone onto the iPod docking station, a pop-up warning appears - "this accessory is not made to work with iPhone", and asks me to switch to airplane mode. What should I do? Either select NO or just leave it and the message will go away on its own. This accessory is designed to work with the iPod's application within the iPhone. You will still be able to receive calls, you just won't be able to use this docking station as a handsfree unit. Is it hard to setup my iPod with this alarm clock? Actually, it couldn't be easier. Just dock your iPod on the alarm clock, set the time you want to wake up, choose iPod as the alarm method, and go to sleep. The next morning, you can wake up bright and early to your favorite music. Is this iPod dock compatible with my ________? This iPod alarm clock has universal dock adapters that are compatible with most members of the iPod family (see tables above). on 2009-08-05 16:14:21 This Ipod-dock is really great ! If you want a docking for your Ipod, this is what you should buy! It charges the Ipod batteries, it plays the music with nice sound and you are able to control it with the remote control. It is not like these big boxes that take a lot of space. I will buy several more !